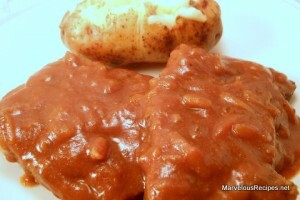 Tender round steak, succulent potatoes and thick gravy, combine to make this dinner incredibly delicious! 1. Cut steak into serving-size pieces and place in bottom of a 5 quart slow cooker. In a large bowl, combine tomato sauce, soup mix, oil, vinegar, oregano, garlic powder and pepper. Pour over steak in slow cooker. 2. Scrub potatoes and pierce on all sides with a fork; place over meat. Cover and cook on Low for 7 to 7-1/2 hours or until meat and potatoes are tender. Remove meat and potatoes and keep warm. 3. To make gravy, pour cooking juices into a small saucepan; skim fat. In a small bowl, combine cornstarch and water until smooth; gradually stir into juices. Bring to a boil over medium-high heat and cook, stirring constantly, for 2 minutes or until thickened. Serve with the meat and potatoes. Makes 8 servings.